Meanwhile, in 2-quart saucepan, cook beef and onion over medium heat 8 to 10 minutes, stirring occasionally, until beef is thoroughly cooked; drain. Stir in cilantro, cumin, chiles and beans. In ungreased 13x9-inch (3-quart) glass baking dish, spread 1 cup of the salsa. Spoon about 1 1/2 tablespoons beef mixture into each shell. 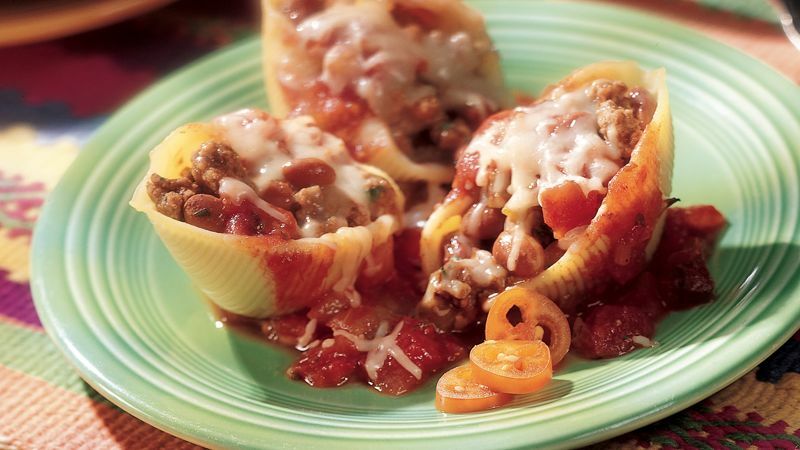 Place shells, filled sides up, on salsa in dish. Pour remaining salsa evenly over shells. Sprinkle with cheese. Cover with foil; bake 30 minutes. Uncover; let stand 10 minutes before serving. For a bit more spice, use 1 jalapeño chile, seeded and chopped, instead of the canned green chiles.